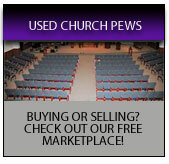 The largest manufacturer of church furniture and church pews in the United States whose sole business is church furniture. 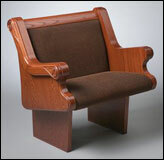 Since 1960, we have supplied the highest quality church furniture and church pews to churches throughout the country. 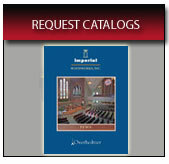 Our product lines include pews, church chairs, pulpits, communion tables, chancel furniture, tithe boxes, and many other custom wood furniture items. We welcome the opportunity to work with nearly all denominations of churches. 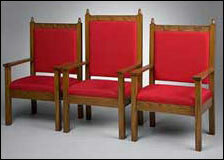 Imperial Woodworks is a family-owned business making custom wooden church furniture. With the family’s second and third generations now in place, our 120,000 sq. 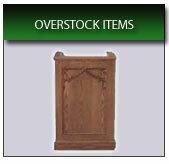 ft. factory allows us to produce everything needed to furnish your church. At Imperial, we combine the latest manufacturing technology with old-fashioned work ethics and customer service. Our ultimate goal is to create a product whose quality and value far exceed the costs, and to forge a new, long-lasting friendship with our customers in the process. Several pew and chair styles are available to match the desired look for your interior décor. All Imperial Woodworks furniture and church pews are designed with scientific, modern ergonomic principles in mind to create the most comfortable church furniture available today. And that creates lasting value for your church. In order to better serve the Architectural community and General Contractors, Imperial is pleased to announce that our products are now listed on the new and improved Sweets program. The web-based software integrates specific products during the design phase with a level of ease and efficiently that has never been available before. Please read our announcement for more details, and let us know how we can work together on upcoming projects.